This luxury tented lodge is on a private concession within easy reach of Victoria Falls, so you can combine the excitement of the falls while staying in peace and tranquility of the wilderness. Sitting on the terrace you'll be able to see spray from Victoria Falls and have views of the gorges that lie between Zimbabwe and Zambia. The Elephant Camp has 12 tented suites, including 2 family units. The accommodation is of a very high quality with air conditioning and fans, tea and coffee facilities, minibar and a separate lounge. The bathrooms are equally well equipped with a bathtub and a shower plus another shower open to the sky. All suites face the gorge and have private terraces with plunge pools. 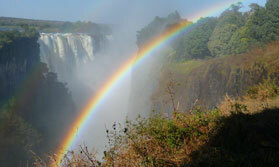 The camp offers free transport to Victoria Falls twice a day. One of the highlights is the opportunity to get close to elephants at the Wild Horizons Wildlife Sanctuary, you get a unique insight into the personalities and family dynamics of these gentle giants. Back in the camp you can relax, enjoy a spa treatment and sample some delicious traditional African food in the main lodge or the privacy of your suite. Communal areas include a lounge, bar, dining area and large open deck with panoramic views of the gorge in the distance. Also on offer is lunch at the Lookout Cafe, here you will enjoy your meal looking out over Batoka Gorge, it's truly spectacular, or why not head off with a guide to a secret spot on the concession to enjoy a magical sunset as you sip on a cold gin and tonic, as another beautiful day in Africa comes to an end. Open: The Elephant Camp is open all year. Location: The Elephant Camp is situated by dramatic gorges in a private concession bordered by the Masuwe River and Zambezi gorges. 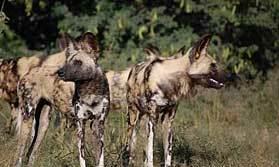 It is 10kms from Victoria Falls and 15kms from Victoria Falls Airport. Rooms: There are 12 luxury tents accommodating a maximum of 24 guests. Facilities include air conditioning, fans, hot drink station, minibar, bathroom with indoor and outdoor shower, private lounge and a terrace featuring a plunge pool overlooking the gorge. There is 24 hour mains electricity. Activities: Free twice daily transfers to Vic Falls, a range of activities at the falls including sunset cruises, gorge swings, rafting and helicopter flights (at additional cost). You’ll also have the chance to encounter elephants at the Wild Horizons Wildlife Sanctuary, enjoy lunch at the Lookout Cafe, take a guided walk in the concession and experience the African sunset at a beautiful and secluded spot. Facilities: The central area is a tented structure housing the dining room, lounge and bar. There is a spacious deck overlooking Batoka Gorge, and an outdoor swimming pool. Trained therapists offer a wide range of treatments in the privacy of your room. A laundry service is available free of charge. Dining: The camp specialises in African-fusion fare and you’ll have the chance to sample some traditional dishes such as sadza (African-style polenta) and chakalaka, a hot and spicy relish. Meals are beautifully presented using the freshest ingredeints and are served at a individual tables in the main lodge or a private dinner in your own suite can be arranged. Children: Children aged 7 years and older are welcome. They should be kept under supervision at all times. Communication: There is free Wi-Fi internet access in the main lodge and in the tents. Notes: The Elephant Camp accepts payment in cash and by Visa and Mastercard. "Experiences were great and quality of tent and lounges etc were excellent.We were impressed at how well our time there was filled with things to do by the staff."